Watch daylight move across the planet. Watch day and night move across the planet and see the current positions of the Sun and the Moon on a world map. Get the optional upgrade to fast forward or rewind the map at different speeds and select a date and time of your choice. You can also jump to any solar eclipse or season and change the look of the world map. 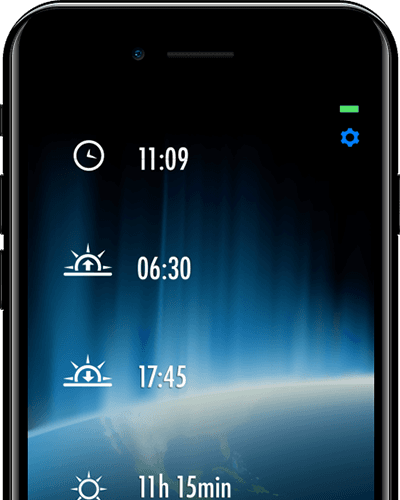 Shows daylight, night, and 3 levels of twilight. Shows the current position of the Sun (☀) and the Moon (○). Shows ongoing solar eclipses on the world map. Synchronizes to show the correct time (requires internet connection). More cool features are available in the optional upgrade (see below). More options for eclipses: Choose any solar eclipse between 1950 and 2050. The animated world map shows where on Earth the eclipse is visible and exactly when it occurs. Animated map: Watch day and night move across the planet. Fast forward and rewind time. Change the current date and time. Choose a season (March equinox, June solstice, September equinox, or December solstice). Choose between 5 animated and scrollable world maps.